Cookery School, accommodation and delicious food! 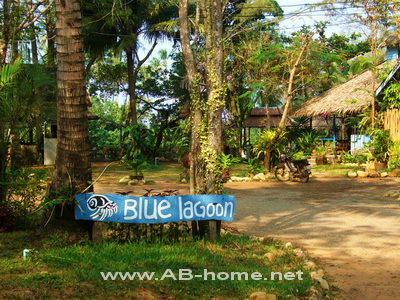 The Blue Lagoon Resort Koh Chang is a cozy hostel with rooms on a mangrove lagoon in Klong Prao Beach. The quiet atmosphere attracts tourists who looking for cheap accommodation on a beautiful site in Thailand. Blue Lagoon Koh Chang has as well a famous Thai cookery school and a yoga center next door. The restaurant over the lagoon serves delicious Thai dishes in a romantic atmosphere which is perfect for candle light dinners in Klong Prao. The landmarks of Blue Lagoon Ko Chang are friendly people, tropical beach and reasonable room and food prices. The coconut palms and the rustic style of blue lagoon make this Resort in Koh Chang to a famous location for tourists who like quiet places with flair.